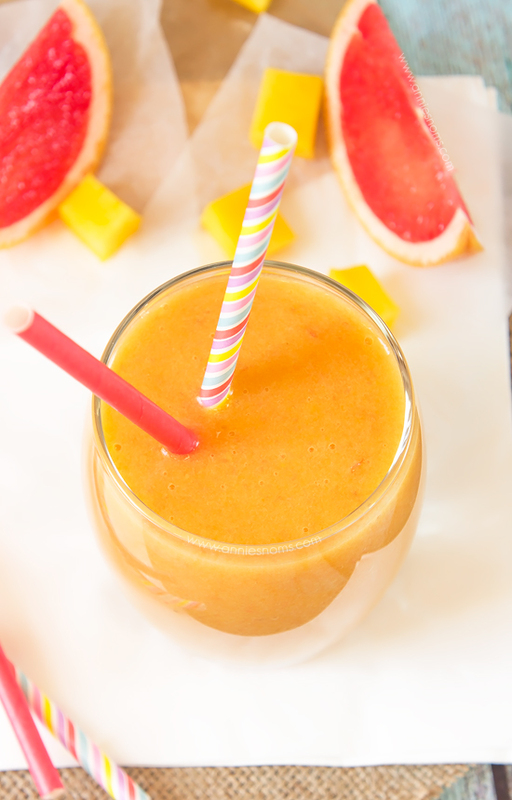 This Mango, Grapefruit and Banana Smoothie marries the strong, tart flavours of grapefruit with the soft, creamy taste of banana and tropical, sweet mango. 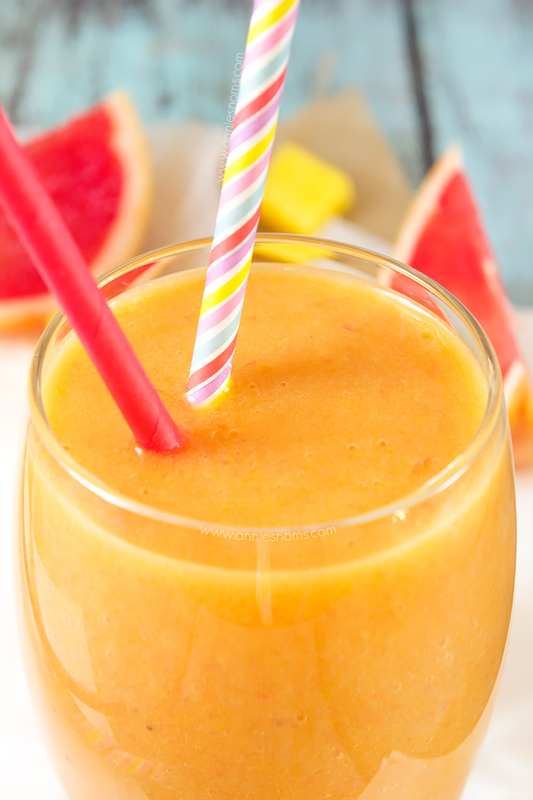 Filling, fruity and just perfect to inject some sunshine into your day! I know this recipe has mango in, but embarrassingly, it’s the first time I’ve actually used fresh mango. I think I probably had a bad experience as a kid as I definitely remember trying it and not liking it. BUT, would you believe, once I cut into that bright, soft flesh and tried it, I fell madly in love. Hence, this smoothie. I know that mango pairs well with grapefruit, but I also wanted a creamy base to my smoothie: enter frozen banana. If you haven’t tried slicing and freezing banana to make smoothies and healthy milkshakes then you are really missing out friends! Do you remember this? Heaven in a glass. When frozen banana is blitzed in you blender, it creates the most dreamy, creamy, ice cream like mixture. Basically soft serve ice cream, without all the calories. 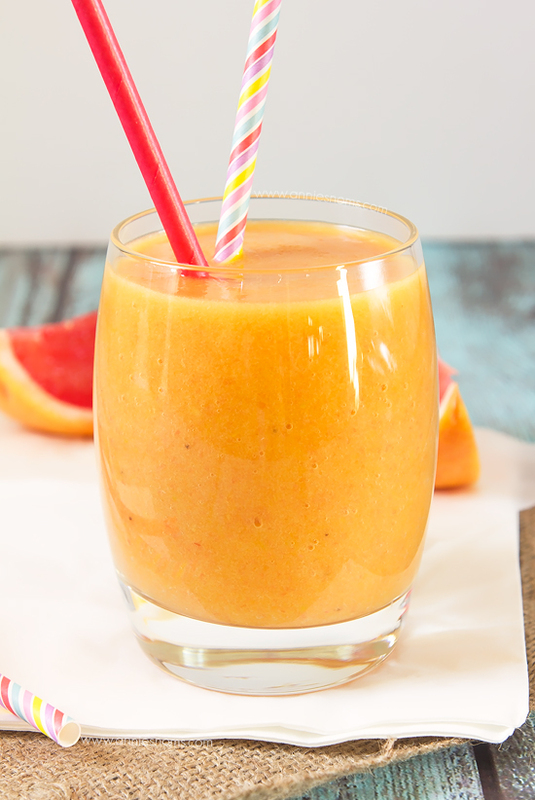 Normally I put milk or water in my smoothies, but for this recipe, I really wanted that creaminess as grapefruit is quite watery and if I’d have just blitzed mango and grapefruit, I was worried I’d have a runny, mess which had texture issues. The addition of frozen banana was exactly what this smoothie needed. 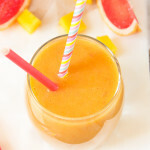 And it works perfectly with the tart grapefruit, you still get a slight hint of banana and it’s sweetness helps bring the whole smoothie together into one delicious drink! Now, for some people (like me) with a really sweet tooth, you might still want to sweeten this a bit. 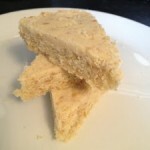 I do love a little tartness, but I have such a sweet tooth I ate those cubes of pure sugar as a child. 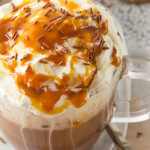 There are many different ways of sweetening this smoothie – for example, I chose natural sweetener (Truvia) and OH chose to sweeten his with agave. I do have to say, agave did give it a really nice taste. Honey is out for us as I’m pretty sure I’m allergic, but you could use it of course. Then there’s that white stuff that everyone knows isn’t good for us, but it still just tastes so damn good: sugar. 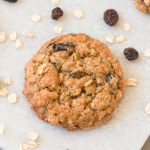 The choice is yours, but promise me one thing: you’ll trust me on the flavour combo here and go and make it – it’s absolutely divine, smooth, sweet, tart, creamy. 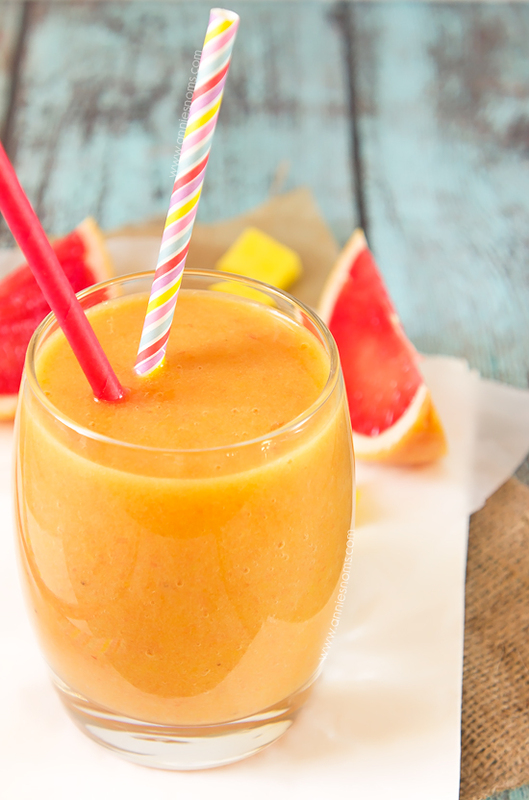 The perfect smoothie to compliment yesterday’s round up! 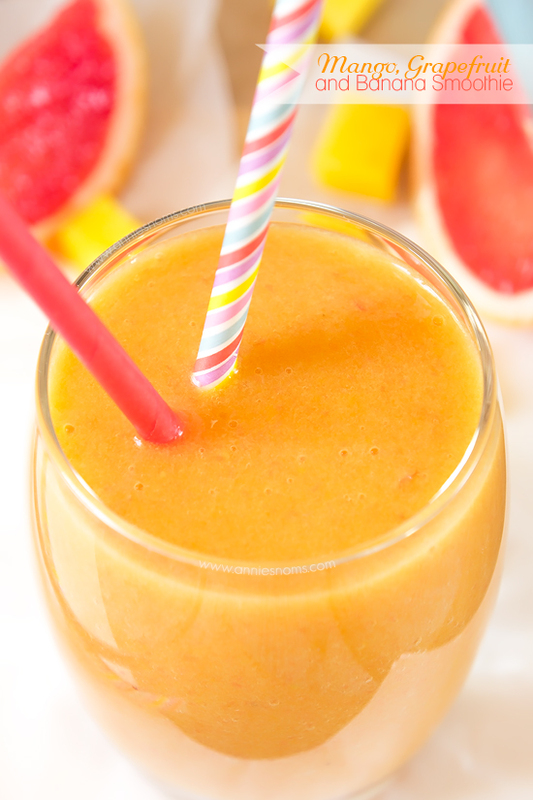 « 25 Super Fruity Smoothies! 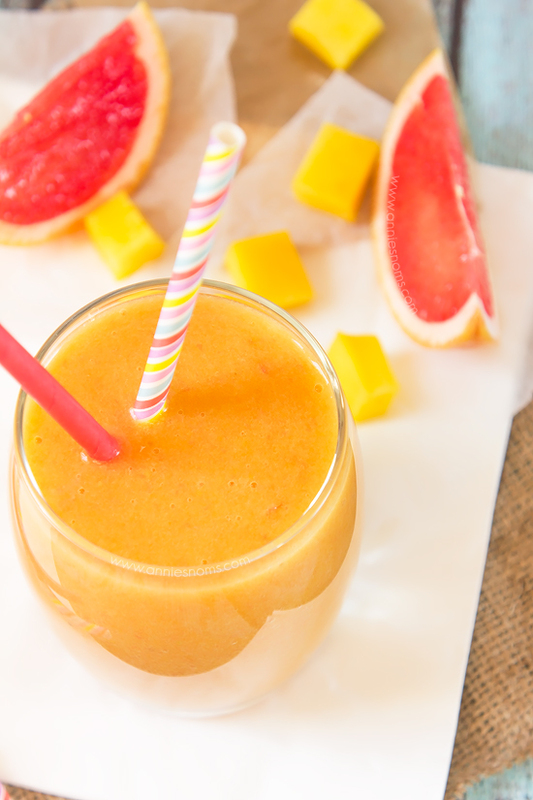 I’m not a huge mango fan but combined with the grapefruit and banana this could be delicious! Pinning! I wasn’t either until I tried this, but I found the banana just balanced it out as otherwise I find grapefruit a little too tart and I usually LOVE tart things! I love the mango! I love the smoothies! Sounds like a great combination, and your pix are lovely! Mango is one my favorite fruits in the world! My girls love it, too. I buy a box of mangoes at Sam’s club, and that’s pretty much the only thing they want to eat until they’re gone. Ohhhh this looks amazing! I love mango and recently got my boys into them too, they will love this one. I LOVE mango! I’d love to try this yummy smoothie! I do as well now, can’t believe it took me so long to try fresh ones again! We love the creaminess banana adds to our smoothies too. I will have to try this recipe out. My husband loves mango! I’ve fallen in love with banana as well, it is just heavenly when frozen! What a gorgeous color! This must taste so delicious! 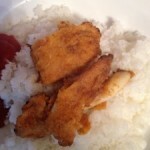 I’ll just bookmark this recipe now, it’s definitely a must try! I’ll let you know how it was. This looks so delicious! I love it all! !